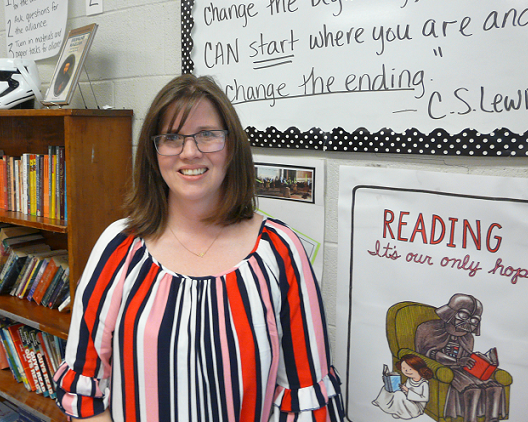 Karen House : April 11, 2019, 1:51 p.m.
Stacey Smith teaches seventh grade English-Language arts at Sequatchie County Middle School. April 11, 2019 – When asked to define teaching in one word, Stacey Smith said, “Passion!” And passion is the perfect word to define Smith as a teacher. On Wednesday she was in a position to which she is unaccustomed. Instead of standing in front of a classroom of seventh-grade students asking questions, she was sitting in front of a camera with someone asking questions of her. News Channel 9 in Chattanooga chose the Sequatchie County Middle School (SCMS) teacher as their Educator of the Week for April 16, and twice in the past week she was interviewed on camera. Smith sees her career as a calling, to help her students fulfill their destiny. She points out the quotation from Mark Twain that is posted at the door to her classroom: The two most important days in your life are the day you are born and the day you find out why. “Teaching is helping them find out why,” Smith said. 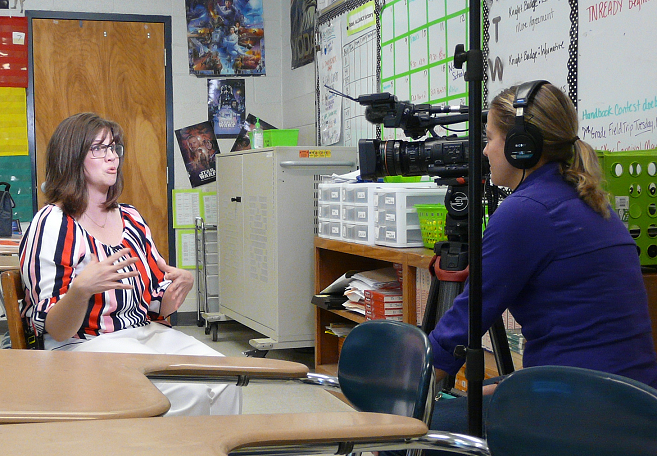 Kellie McClune of News Channel 9 interviewed Stacey Smith as Educator of the Week. Even though both her parents were educators, Smith started out to be a marine biologist. Her change of direction came in a chemistry class. It took a lot of work and the help of several mentors to get her through that chemistry class with an A. Over 20 years later, she is still teaching and still passionate about making a difference in the lives of her students. Every person is put on this Earth with certain Gifts, she explains. This is their Brain and their Talents. 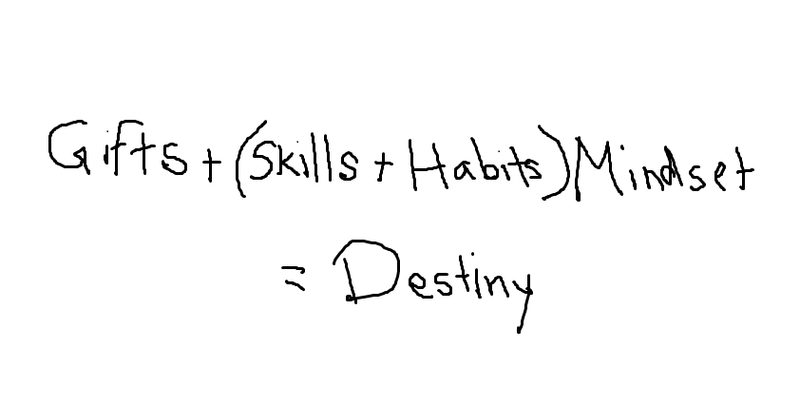 Over time, Skills and Habits are added to that by parents, teachers, and other people, and that is multiplied by their Mindset, to determine their Destiny. The variable in that equation that is in the hands of every child is the Mindset. “If I have a growth Mindset and I can learn from my failures and mistakes, then I can fulfill my Destiny,” Smith said. “I tell my students you can't change last night, you can't change this morning. You can only change right now, and then move forward. Stacey Smith has taught school for 24 years, the last 18 of those at SCMS. Principal Devona Smith said that in Smith's English-Language Arts class, every student has the opportunity to be recognized for what they have accomplished. Stacey Smith will be featured on the News Channel 9 noon broadcast Tuesday, April 16, and again on the 17th at 12:30 p.m. EDT on “This-N-That.” She will also be one of several area teachers that will appear in a “Teacher Social” the TV station will broadcast at the end of the school year.